A reading and book signing by first time novelist Alison Umminger ’92. Generous sponsorship by Library and Atom has enabled us to provide this event free of charge; one free drink provided with each ticket. Space is limited. Alison Umminger grew up in Arlington. Virginia, and as an undergraduate was the fourth woman to be elected president of The Harvard Lampoon. Today, she is an associate professor at the University of West Georgia in Carrolton, Georgia, where she lives with her husband, a blues musician, and their four-year-old daughter. 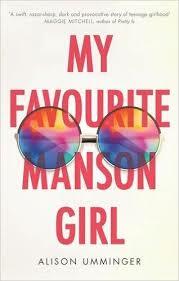 My Favourite Manson Girl is her first book. Anna has had a miserable year. Everything feels wrong with her life, and she feels wrong in it. Rather than stay and face the mess, she steals a credit card from her stepmother and books a flight to L.A. to crash with her older sister: exceptionally beautiful, sharp-tongued, a struggling actress in Tinseltown. Tailing Delia around, amongst her sister’s admirers, colleagues and competitors, the reality soon dawns on Anna that this isn’t the escape she envisaged. Trapped in a town of wannabes and lost souls, she has no cash, no friends, no return ticket. When her sister’s obsessive ex ‘hires’ Anna to research the girls of Charles Manson’s cult to inform an independent movie he’s producing, it’s far from the ideal summer job – but she needs cash in hand to buy her way home. While Anna starts to draw parallels between the murderous Manson ring and the Hollywood world of painted-on smiles that she is becoming part of, things quickly turn from strange, to dark – to dangerous. This is a story about being young, lost, and female. It’s a story about how girls disappear.